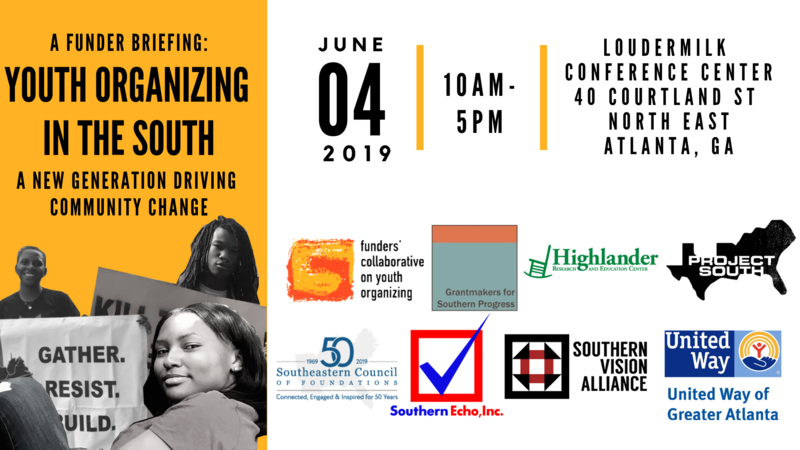 The Funders’ Collaborative on Youth Organizing invites Funders to join us on June 4th for a funder briefing focused on how young people today from across the South are building on long traditions of youth and intergenerational organizing. From the civil rights movement to current efforts for safe communities and just schools, young people from across the South have always been at the forefront of advocating for just and equitable communities. Building on this proud tradition, a new generation of Southern young people is leading efforts to advance health, justice, equity, and dignity. New research shows that engaging young people in organizing can not only create stronger communities, but is also one of the best ways to support young people’s holistic development. FCYO, in collaboration with Grantmakers for Southern Progress, The Highlander Research and Education Center, Project South, The Southeastern Council of Foundations, Southern Echo, Inc., Southern Vision Alliance and The United Way of Greater Atlanta invite you to Atlanta, GA to engage with youth leaders and local and national funders to discuss how to support young people as drivers of community change across the South. Hear from young leaders from across the South about how they are building on long standing organizing traditions and innovating new ways to develop leaders and advance justice and equity. Explore the latest research findings on the multi-tiered outcomes of youth organizing. Speakers will be announced soon - Please check back!